Marion M. Pujanauski, age 89, of the Harbor Village, Port Washington, formerly of North Montgomery Street and West Grand Avenue, Port Washington, passed away peacefully at her residence Friday, August 30, 2013, after a short battle with cancer. Born in Port Washington on April 20, 1924, Marion was the daughter of John L. and Cecilia Lecher Schmit. A lifelong resident of Port Washington, Marion attended St. Mary’s Catholic School and graduated from Port Washington High School in 1942. She became the first female fulltime bank teller at the former 1st National Bank. On June 29, 1946, at St. Mary’s Catholic Church in Port Washington, she married Frank “Puch” Pujanauski, also of Port Washington. She left the bank and started her new life and family. Her life was full and complete, filled with love and joy provided by family and friends. While Puch traveled sorting mail on the train or painted houses when in Port, Marion managed the home on North Montgomery Street. She was active with the Girl Scouts, Boy Scouts, and other activities involving her children’s interests. Her involvement with her church included the St. Mary’s Christian Women (member and past president), Daughters of Isabella (membership), annual parish dinner coordinator for over ten years, and parish funeral fellowship/luncheon coordinator for over ten years. For over twenty-two years, Marion volunteered with the former St. Alphonsus Hospital Auxiliary as a “pink lady” on the floor and in the gift shop. After her husband’s retirement, they enjoyed traveling and continuing their learning through the Elderhostel system as well as visiting family throughout the country. In the late 1990’s Marion and Puch left the Montgomery Street home where they had spent nearly forty years and moved to West Grand Avenue. On November 15, 1998, her husband preceded her in death. Marion was an avid games player, especially bridge, Trivial Pursuit, various versions of solitaire, and bingo. 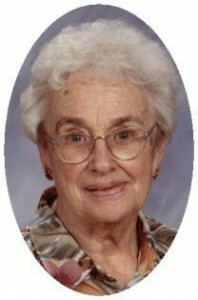 She continued to participate in various bridge clubs with friends in and around the Harbor Village, where she moved in April of 2010. She continued to keep in touch with family and friends on the phone even after a stroke in 2001 took most of her eyesight, never dwelling on her limitations. She will be remembered as a wonderful grandma, always proud of her grandchildren and sharing their life’s accomplishments with others. During the last seven years she traveled to various locations in WI as well as to IL, SC, MN, IA, Puerto Rico, and VA to attend weddings of her grandchildren and to celebrate the births of her great-grandchildren. Her positive attitude never faltered, even after the cancer diagnosis in May, 2013. Marion is survived by seven children, Cecilia (Michael) Anderson of Algonquin, IL, Kathleen (Michael) Fitzpatrick of Boone’s Mill, VA, Paul (Cynthia) Pujanauski of Mount Pleasant, WI, Christine (John) Kappelman of Cedar Grove, WI, Bruce (Jeanne) Pujanauski of Oak Hill, VA, Amy (Robert) Galasso of Boring, OR, and Therese (Douglas) Chenevert of Lakeville, MN; twenty grandchildren: Anne Michelle, Elizabeth, Nora, Emily, Colin, Katie, Paul Matthew, Eric, Kristin, Rachel, Joshua, Matthew, Meghan, Brian, Lindsey, Kevin, Oriana, Gianni, Drew, and Lauren; eight great-grandsons: Andy, Cooper, Ben Connor, James Brady, Tyler, Ryan, Kieran James and Patrick Nicholas; three sisters: Ruth (Jim) Lorge of Port Washington, Cecilia (the late Harry) Preisler of Random Lake, and Barbara Bichler of Port Washington; brother Donald (Audrey) Schmit of Scotsdale, AZ; brother-in-law George (the late Doris) Franks of Port Washington; nieces, nephews, other relatives, and many wonderful friends. Marion is preceded in death by her husband Puch, granddaughter Sarah Anderson, grandson Nicholas Kappelman, brother Robert and his wife Harriet Schmit, brother Elmer and his wife Lucille Schmit, sister-in-law Eleanor Franks, brother-in-law Albert and his wife Helen Pujanauski, and brother-in-law Harry and his wife Pat Franks. A Memorial Mass of Christian Burial will be celebrated at 12 Noon Saturday, September 14, 2013, at St. Mary Catholic Church, 430 N. Johnson Street, Port Washington. The Reverend Thomas Lijewski will be the celebrant. Interment will take place at St. Mary’s Cemetery in Port Washington. Family will receive friends from 9:30 to 11:30 AM Saturday, September 14, at the POOLE FUNERAL HOME/Crematory. St. Mary’s Christian Women will lead a rosary at 9:30 AM at the funeral home. Memorials to the charity of your choice are appreciated. Thanks to Dr. Tedmond O’Reilly and staff, Harbor Village staff, Visiting Angels Liz and Wendy, and nurse Chris and aide Kathy of the Aurora VNA Hospice.